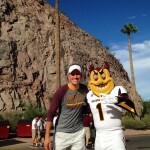 These qualities intensify on gameday as surrounding streets and parking lots get swarmed with maroon and gold. 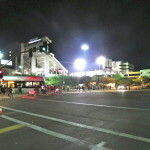 The drumline from The Sun Devil Marching Band puts the beat on the street for fans taking in a little gameday atmosphere. 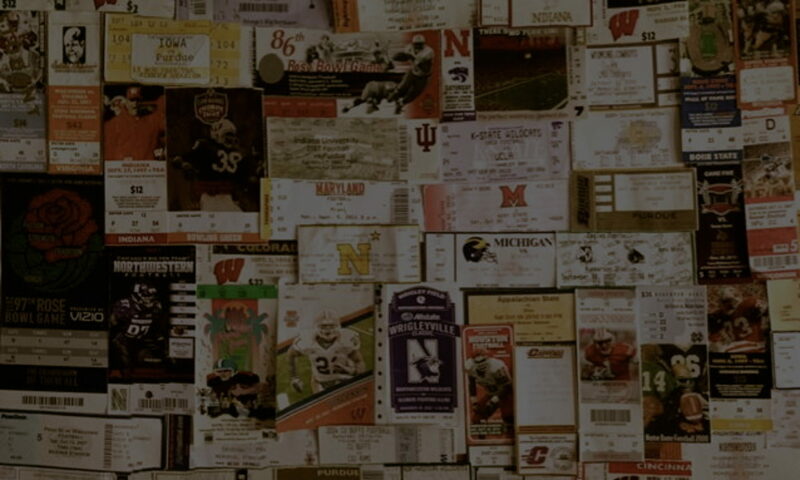 Bars and colorful establishments fill to the curb with anxious fans. 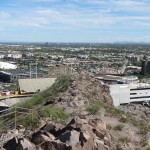 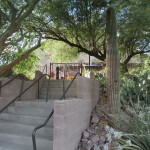 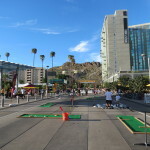 Much of the action can be seen high atop “A” Mountain, which offers sweeping views of downtown Tempe and the skyline of Phoenix in the distance. 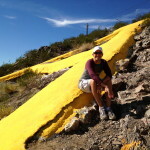 The oversized “A” that is painted near the summit is a proud symbol of the university. 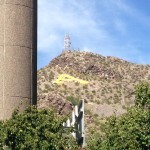 During Welcome Week, incoming freshman whitewash the “A” in a tradition that symbolizes the beginning of a new school year. 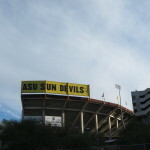 The week of the Arizona contest (the hated adversary to the south), you might find a protective bunch of ASU partisans guarding the “A” from being painted a rival shade of red and blue – the interstate-10 hate is real. 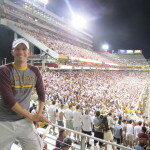 As pregame festivities progress, many find their way over to Wells Fargo Arena to see the marching band perform their pregame show. 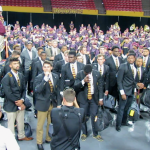 The highlight is the Devil Walk, where the Arizona State players file in down the stairs through the fans and onto the gym floor to the tune of the ASU fight song. 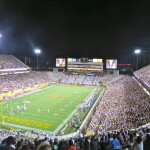 Players greet the fans and thank them for their support before heading over to Sun Devil Stadium. 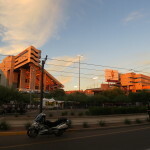 Built between two mountain buttes, Sun Devil Stadium’s natural surroundings provide a stunning contrast to the urban hustle bustle below. 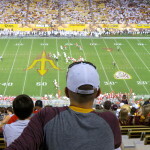 The stadium itself, which used to host the Fiesta Bowl annually, is astounding in size and structure – it’s hard to miss when you take the exit off the highway into Tempe. 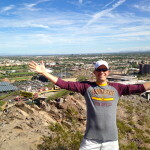 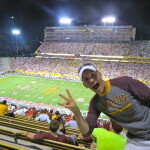 Filled with Arizona State faithful, Sun Devil Stadium is formidable. 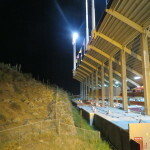 Fireworks and rambunctious cheers welcome the players as the enter the field. 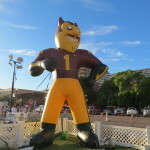 The beloved mascot, Sparky, pumps up the crowd and raises his pitchfork in defense of his home turf. 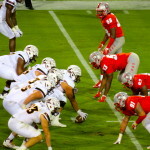 Following a Sun Devil victory, that pitchfork is handed to the team to plant into the field – “putting a fork” into their opponent. 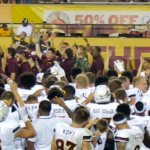 The singing of the alma mater ensues, played by the band and sung by the entire team. 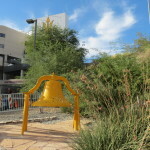 The energy and excitement that courses through the streets of Tempe on gameday is awe-inspiring. 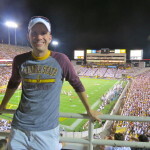 With so much history and passion, Arizona State provides college football fans with a uniquely festive and memorable experience.